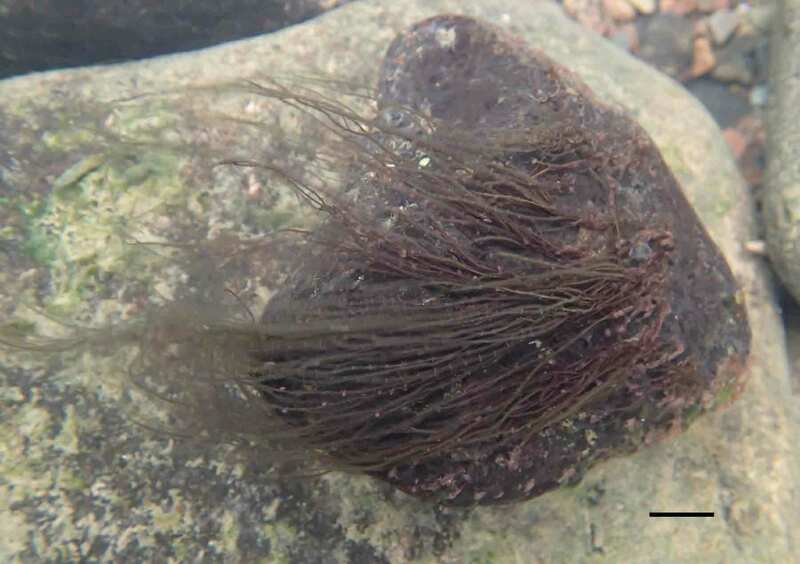 The rocks in the fastest-flowing sections of the lowermost of our four sample sites on the River Ehen were all smothered with the coarse filaments of Lemanea fluviatilis. Lemanea is another red alga (see “The schizophrenic life of red algae …”) but one that grows to a much larger size than Audouinella which I wrote about back in early February. I wrote about Lemanea last year (“The River Ehen in April”) but that was before I had an underwater camera. However, most of the Lemanea is attached to large, stable boulders located in sections of the river where the fast current made it almost impossible to photograph safely. Instead, I hunted around and found a smaller stone that was wedged in amongst these, and moved this to a shallow area where it was easier to photograph. Lemanea fluviatilis from the River Ehen in March 2014. Scale bar: one centimetre. If you look closely you will see that each of the filaments has a series of nodes along its length. Under the microscope, these nodes form darker patches, composed of smaller cells than the rest of the filament. These are, in fact, the reproductive structures, spermatangia, of the plant as Lemanea has a similar life-cycle to that of Audouniella, which I described in my earlier post. There is also a closely-related genus, Paralemanea, which looks like Lemanea but which has these spermatangia in rings rather than in patches. Older books do not recognise the distinction between Lemanea and Paralemanea. Lemanea fluviatilis from the River Ehen, March 2014. a. low-power image showing the knobbly stems; b. close-up of a single stem showing the spermatangia patches associated with these protruberences (scale bar: 20 micrometres; 1/50th of a millimetre); c. close-up of a patch of spermatangia. Lemanea is, in my experience, a very useful indicator of good quality aquatic ecosystems. Looking back through my own records, I see 88 per cent are associated with “high status” or “good status” conditions and the few instances where it is found associated with poorer quality conditions, it is always quite sparse. There is a site quite close to Durham where we used to find Lemanea despite the water being quite enriched with nutrients: though low down in the catchment there was an extensive riffle area with fast currents and, I suspect, few other organisms able to compete for Lemanea’s favourite conditions. Remember, too, that there are enormous reserves of Lemanea in the upper catchment of the River Wear, and plenty of opportunities for this to be scoured off boulders and carried downstream. The wise ecologist always works on “balance of evidence”, rather than making categorical judgements on the presence or absence of a single organism. There is, simply, too much that we still don’t know about the biology of these species. This entry was posted in Uncategorized and tagged Lemanea, red algae, River Ehen. Bookmark the permalink. I have only found Lemanea once years ago in W. Sussex on a weir & that material was vegetative. However, I wonder whether your specimen was cystocarpic rather than spermatangial. Thanks, Bill. In this case, I am fairly sure that I was looking at spermatangia as Lemanea’s carposporophytes are formed in the central cavity of the filament and are released by thallus deterioration. There is a good picture of this in the Freshwater Algal Flora of the British Isles (plate 42, p. 176).